My dad eats rice with every non-breakfast meal. For serious. Rice, and a banana, with whatever entree they've made to go with it. Which means a good 75% of our dinners growing up, we had rice as our main staple. Not unusual in a Filipino family. But, this Mahatma magnet is not that rice. 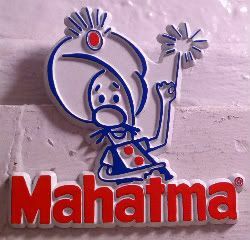 I've never actually heard of Mahatma, but apparently, it's America's favorite, according to their site. My sisters gave this magnet to me, from an Embassy day they did in DC. I actually had to look this up, cuz I was convinced Mahatma was a country I didn't know about. Don't judge, I just had no idea. The Mahatma site also has a section devoted to Riceipes, which makes me crazy for a couple of reasons. The very concept of rice recipes is completely foreign to me - that they exist and that they involve different ingredients and rice. On the other hand, there's a small part of me that wants to try them. We've always had the steamed rice you normally find in Chinese restaurants. The other stuff's just foreign to us. It's beyond our ken that someone out there actually wants unsticky rice. I mean, I've actually mocked those commercials that show the cooked rice freely tumbling into the bowl.